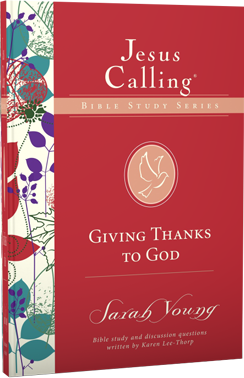 In Giving Thanks to God, the fifth study in the Jesus Calling® Bible Study Series, you will explore what God’s Word has to say about the many ways He provides for you—and why you should give thanks to Him for this abundance. Even when you are going through trials, you can have an attitude of thankfulness, for the Bible says that you have been given “every spiritual blessing in Christ” (Ephesians 1:3). When you realize the depth of God’s love and the lengths He went to reconcile you to Himself, it naturally causes you to want to praise Him! Each of the Jesus Calling Bible studies includes devotional readings from Jesus Calling, selected passages of Scripture for reflection, Bible study questions, and additional questions to help you apply the material. This study can be used for personal reflection and Bible study or in a small-group setting. • CONSIDER IT. The one or two questions in this opening section serve as an icebreaker to help you start to think about the theme of the session. If you’ve had a busy day and your mind is full of distractions,this section will help you better focus. • EXPERIENCE IT. Here you will find two readings from Jesus Calling along with some questions for reflection. This is your chance to dive deeper into the biblical principles found within the Jesus Calling devotions. This section will help you apply these biblical principles to your everyday habits. • STUDY IT. Next you’ll explore one or two Scripture passages connected to the session topic and the readings from Jesus Calling. You will not only analyze these passages but also pray through them in ways designed to engage your heart as well as your head. • LIVE IT. Finally, you will find five days’ worth of suggested Scripture passages that you can pray through on your own during the week. Suggested questions for additional study and reflection are provided.